Sunriver Art Fair provides a dramatic outdoor gallery where the whole family can explore, enjoy and experience outstanding art and entertainment in a relaxed, scenic setting, August 10-12, 2018. This year’s fair promises to be the best yet! 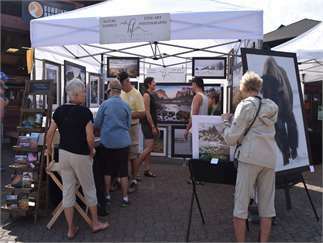 Sunriver Art Fair is a 3-day, juried fine arts event held in the beautiful Village at Sunriver. More than 75 artists will display and sell their artwork, including ceramics, glass, jewelry, painting, photography, sculpture, textiles, woodworking, drawing and mixed media. There is a mix of styles to meet a range of personal tastes and budgets. It makes for a great weekend of art, music and sunshine for all to enjoy. Several favorite artists are returning as well as many new artists who will be on display for the first time this year. “Artists really enjoy our fair and look forward meeting and mixing with visitors and volunteers,” states Meyer. There will be live professional entertainment all three days, ranging from Hawaiian to bluegrass to swing. Special events include a Saturday night street dance in the Village, featuring crowd favorite, JuJu Eyeball, a marvelous Beatles tribute band. A children’s drop-in art center lets young artists try out their skills and makes it possible for the whole family to experience the Art Fair. The children’s center is open from 10:00am-1:00pm, all three days. A variety of tasty food items are available for purchase at the Village restaurants and shops. The Sunriver Art Fair is a year in the planning, and involves more than 140 volunteers of the Sunriver Women’s Club. Over the last several years, the nonprofit club has distributed more than $530,000 to community agencies that meet the basic needs (i.e., shelter, health, food, clothing and education) in the Three Rivers and South Deschutes County area. Join art lovers, collectors, browsers, and many others Friday, August 10 and Saturday August 11, 9:30 am-6 pm, and Sunday, August 12, 9:30 am-4 pm. For more information, check online, www.sunriverartfair.com, or visit our Facebook page, Sunriver Art Fair.